I haven't written a blog post in over a week, and don't think it hasn't bothered me, but it's been one of those weeks where not a lot has been happening, and in my head I've been doing a lot of pontificating. For your sake and mine, I have left those thoughts in my head where they belong. But finally, I have real news to share! 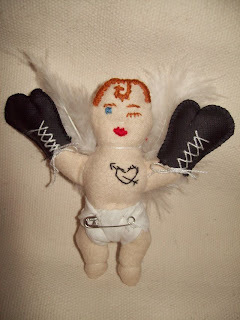 This week I won another creativity contest on Creative Construction for my Cupid doll. If you ever wondered how we mother/artists do it, you can find out there. and a deserved win at that!